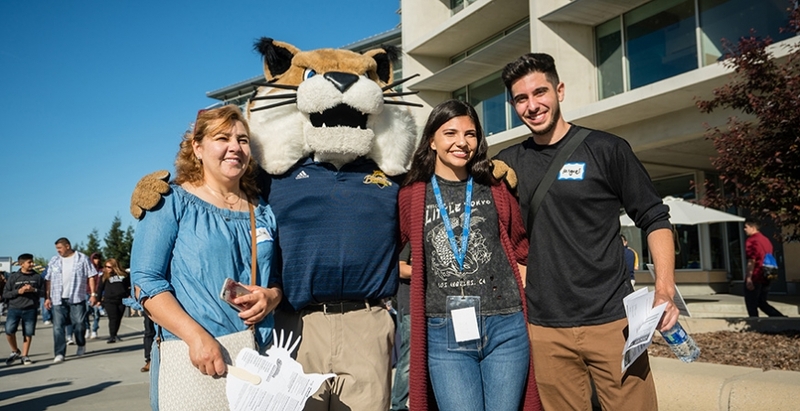 About 1,200 admitted students and their family members visited campus on Bobcat Day, and many accepted their UC Merced admittance offers on the spot. More than 3,700 individuals visited UC Merced last Saturday during the campus’s annual Bobcat Day — a 26 percent increase over 2017 and more than any previous year. About 1,200 admitted students and twice as many family members and other guests sampled all the campus has to offer, learning about financial aid, housing, class registration and different clubs and organizations. For the first time, the campus hosted lab tours showcasing where some of the campus’s innovative and collaborative research takes place. After a full day of exploration, more than 100 prospective students accepted their UC Merced admittance offers on the spot, and more are accepting each day. 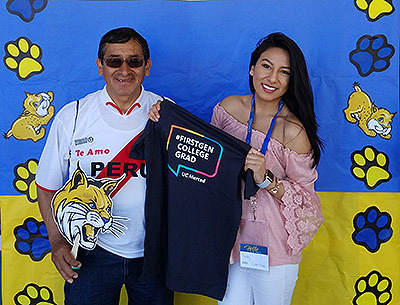 Sarahy Condor Montes, a first-generation biological sciences major originally from Perú by way of Chico, was one of them. First-generation student Sarahy Condor Montes is excited to start her journey to a medical career. Bobcat Day also coincided with ALUMNI WKND, a spring tradition dating back to UC Merced’s early years. Alumni get to participate in Bobcat Day while also discovering all that’s changed since their college days. This year’s event included updates on the Merced 2020 Project, a celebration of alumni who endowed scholarships to the campus over the past year and the annual Alumni Town Hall. The ever-popular gathering is an intimate event that allows alumni access to campus leaders for a moderated Q&A session. The town hall theme this year was women in leadership. Brooklynn Pham (‘09) moderated a conversation between attendees and Chancellor Dorothy Leland, School of Natural Sciences Dean Betsy Dumont and Chief Financial Officer Veronica Mendez. The trio shared their experiences with everything from breaking into the ranks of senior leadership to the realities of growing a university in times of constrained resources. All three spoke of the importance of being gutsy and being willing to take risks. Leland recalled a time when seeking leadership opportunities and having to prove she was capable of serving on a strategic planning committee – something not considered “women’s work” at the time. I would not be where I am today had I waited for someone to open the door for me. Prospective students tested prototypes of Engineering Service Learning team projects, including a drone system used to help identify disease in grape vines. Before Saturday’s campus activities began, alumni were up early preparing meals for the animals and cleaning out exhibits Merced’s Applegate Park Zoo. This is the second time the group has gathered for a “Bobcats Give Back” community service project to help the surrounding community. While there, the alumni stopped by to say hello to Boomer, the campus’s original living mascot, who resides at the zoo. Alumni aren’t the only Bobcats who give back. Community service is a tradition that starts early in a UC Merced student’s career. More than 100 Engineering Service Learning students spent Saturday sharing how they contribute to the greater area. They took to the Carol Tomlinson-Keasey Quad to showcase their projects for prospective students and others. Each semester, Engineering Service Learning undergraduate students contribute more than 7,800 hours serving the community. Teams use their combined technical skills to provide meaningful solutions tailored to their nonprofit community partner’s needs. In return, they gain professional, hands-on experience. During Bobcat Day, individuals were able to test project prototypes, which vary from an aerospace exhibit for a traveling museum to identifying disease development in grape vines. The teams were eager to gather feedback and answer questions from attendees to improve the prototypes they spent the semester designing and testing before they deliver the finished product to the end-users.